Conflict of Interest Disclosure Form is a mandatory condition for any manuscript to appear in Journal of Clinical and Investigative Surgery. Once the article has been accepted for publication, the corresponding author must fill and sign (on behalf of all coauthors) the Conflict of Interest Disclosure Form (download here or from ICMJE), which will be sent to the journal editorial office. If you are not able to open this document (like in this example) could be due to the fact that you do not have the right version of Acrobat Reader DC, which can be free downloaded from Here. Conflicts of Interest Disclosure Form presents any existing or potential conflict of interest for the submitted manuscript. Such conflicts of interest of authors refer to possible relationship/ ownership interests in corporations whose services or products are related to the content of article. Relationships interests for example are regarding employment or belonging to the board of directors of an industrial concern, membership on advisory council/ committee, association with publicity of company, etc. Ownership interests refer to partnership/ membership/ equity position in an industrial corporation or other similar entity, rights related to patent or intellectual property, ownership of stock or stock option, etc. Other conflicts of interest could be represented by receiving grants, funds, honorarium or consulting fees from corporations whose activity include the article domain of study. 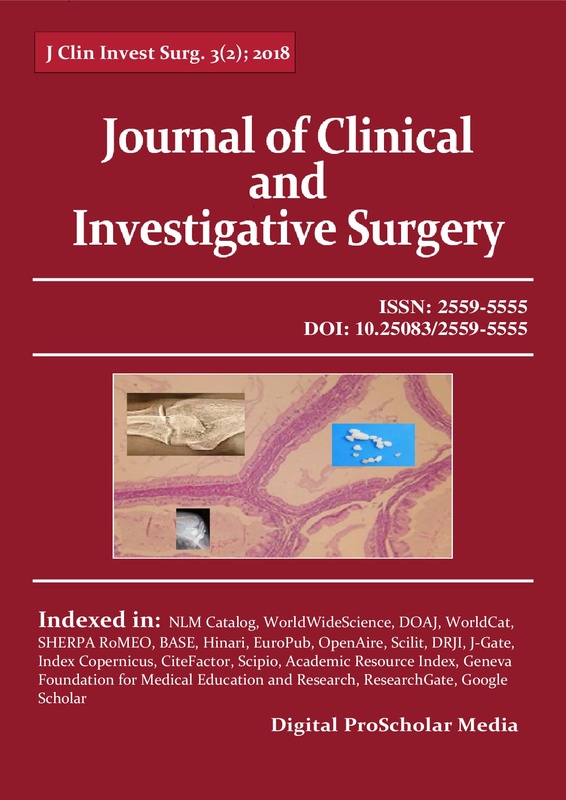 Copyright Transfer Agreement Form is not required to be completed, Journal of Clinical and Investigative Surgery allowing the author(s) to hold the Copyright of accepted and published articles without any restrictions. Covering Letter should state that the manuscript has not been published before and that it is not offered simultaneously for publication elsewhere. The full responsibility for all presented data in a submitted article belongs to authors. Manuscript should not contain data that could be offensive, scandalous, libelous, false, obscene, or contrary to laws. The manuscript must not contain information (texts, tables, illustrations, etc.) from previously published materials, regardless language and publisher. If such information (protected by copyright of others) were used, you must certify that obtained (prior to submission) written permission from copyright owners for the use and reproduction of the respective information, and that you agree to transmit (if the case) such written permissions to the respective Journal, upon request.